Despite the beautiful sunset that adorned our departure from Saidia, it was not long before we were right in the thick of some pretty strong winds with waves to match. The result ... We’re still not sure who’s more stubborn, Nick or Roo?! Neither was prepared to admit we should have turned back to the marina to wait for the winds to calm and sit out the swell ... So, 7 hours down wind to the East in 25 knots+ it was! We headed into Algerian waters, nowhere near where we were meant to be going, but then finally, at around 7 am, the wind and swell dropped and we could finally head North towards Cartegena. Before we hit the shipping lanes we got buzzed by a low flying NATO aircraft taking pictures (we learned later) of the boats crossing from Morocco! Again we waved and smiled happily! We would love to have a copy for the scrap book! 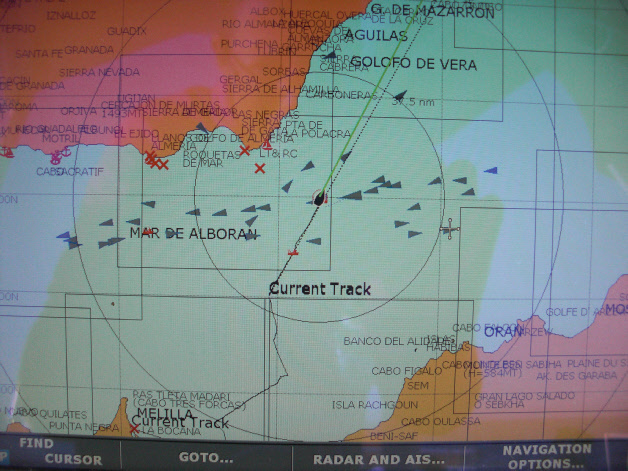 Cartegena’s shipping lanes were our busiest yet (and the picture only shows those with AIS!)!! Formalities taken care of, we had a ball exploring this beautiful city, taking in the ancient sites and enjoying the scenic streets. At the end of May the Ootnic’s took a slight detour to see Nick’s bro so we could all celebrate his 30th together :) Nick faced quite a conundrum though - what do you give your 30 year old brother?! Perhaps a boomerang to replace the one you lost for him on his 13th birthday?! Perfect! He was chuffed (but didn’t let Nick have a go this time)! !